“Cute Amigurumi Monsters” is a crochet pattern book with 10 different little monster projects. The designs are all by Yolanda Soto-Lopez. 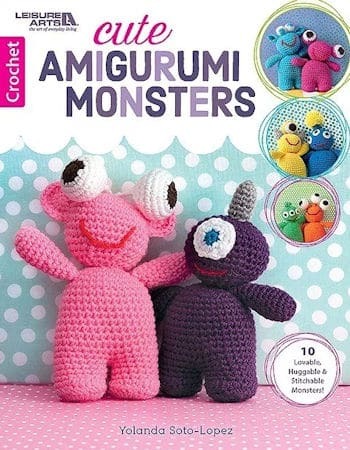 In case you’re wondering, “amigurumi” is simply a Japanese word meaning a crocheted or knitted stuffed doll. 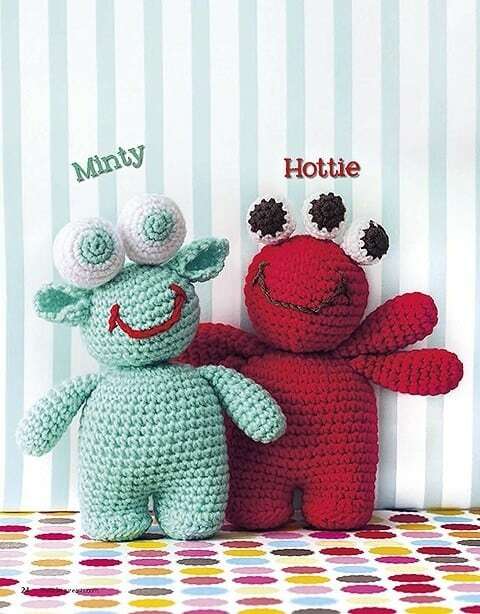 Amigurumi is the same thing as stuffed animal or stuffies; it’s just a name for them that’s currently most popular. You may also find the words “ami” and “amis” being used as shortened versions of the same thing. Not to worry, though. There is no special technique. They’re the same stuffed crochet animals or dolls that you’ve come to know and love. The monsters measure between about 7 inches and 10 inches. I think I would like to try double-stranding and see if I can get some BIG monsters. How fun! Minty, shown here on the left, is my favorite of the bunch. So cute! There are easy stitches here. You just need to be certain that you’re working at a tight enough tension that your fiber filling stays inside. The pieces are all very easy to make and you simply sew them together with a yarn needle. Amigurumi are fun and easy to make. Yolanda has used easily accessible Red Heart Super Saver for all of these designs and the exact colors are listed in the book to make it easier to get your supplies together. One name will be chosen randomly from all names entered prior to close at 11:59pm (CST) on December 10, 2018. Sign in through Facebook or with your email address to enter. Choose any of the other options for additional entries, including a daily bonus entry. Good luck, everyone!